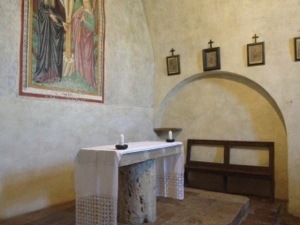 Our last day in Assisi I was resolved to see the one Fransiciscan sight that had yet escaped me: San Damiano. Though I’d seen the San Damiano cross earlier in my trip at Santa Chiara, I wanted to escape Assisi’s walls and go to the site itself. San Damiano is best known for being the place where St Francis had a religious vision before the cross which told him “Repair my church”. Most of the sources describe the church as being “outside Assisi”, which technically it is, though its not even a mile walk from the Porta Nuova on the southeastern side of the town. We walked down a rural path with olive trees and meadow on either side. The trek was an idyll, bittersweet only because we were walking down with the knowledge that at the end we’d be walking up. We could see the church on the horizon and I sighed: how blessed a retreat this must have been for Francis when he prayed here! As soon as we got to the church all expectations of retreat were abandoned: it was swarmed with tour groups. We made our way down the first steps toward the church, dodging youth group members in matching t shirts, and saw a lovely statue of St Clare. 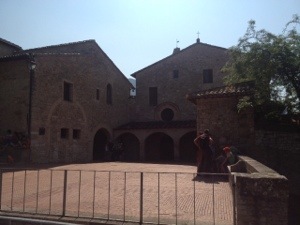 A large part of San Damiano’s significance is due to the fact that it was the home of the Poor Clares during St Clare’s lifetime. 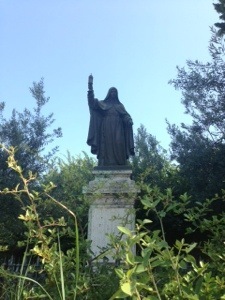 So the first thing that greeted us was a statue of Clare holding the ciborium, as legend holds she did to ward off attacking Saracens during her lifetime. The church itself is simple, with a few small rooms and some living space for the monastery. Like many churches in Asisi and throughout Italy, it contains a surprising amount of modern religious art. We come to the “old country” expecting to walk into the past, but find the contemporary seamlessly woven in, like the modern stained glass of St Clare looking into the church. 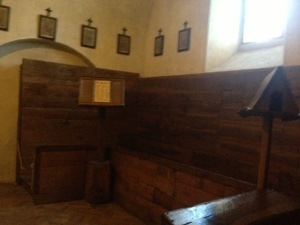 …and worn, dark choir stalls with a single, shared stand for music to your right. Clare and those first sisters managed to sing the hours, to sing their praises without voice lessons, without music degrees, without fastidiously running scales before making any sound in public. How could my breath not catch in my throat while beholding this holy place, where women who were willing to sacrifice everything sang without guile hour after hour. Not far from there is the place where Clare died, marked with flowers and plaques and art. Her last words are inscribed there as well: E tu signore, sii benedetto perchè me hai creato. And you, Lord, blessed be for you have created me. After leaving the church we used the WCs, which were attended by a friendly, simple man who liked to ask where people were from. He took one look at me and recognized me as Sicilian, but I was so flustered I said “che?” and he second guessed himself, asking if I was Italian. Technically I’m both, but the Sicilian, genes won in my gene pool, so I admitted to Sicilian grandparents but American birth. Blessed be God who has created me. This entry was posted in music, singing, travel. Bookmark the permalink.